Product Description: This Digital Thermometer Hygrometer is a battery meter for measuring relative humidity and temperature. The Thermometer Hygrometer can display three types of temperatures around the sensor's air via several convenient procedures: The ambient temperature, the dew-point temperature and the wet bulb temperature. Product Description: Data Hold Display Back Light MAX/MIN Data Logging up to 100 groups Low battery indication Widely Applications： Use in living and office area, machine room, data storeroom, traffic environment, timely knowing the temperature and humidity, playing an important role in building a healthy life. Use to check the plants' living condition, when planting flowers and trees. Use to keep track of bad moister on sound equipment witch can harm electronics. Use to check the performance of heating and air conditioning equipment accurately by building engineer. Use to keep careful track of the humidity in wine cellar. HVAC must have, good for superheats,fast accurate readings. Wonderful meter for ghost hunters or paranormal investigator. 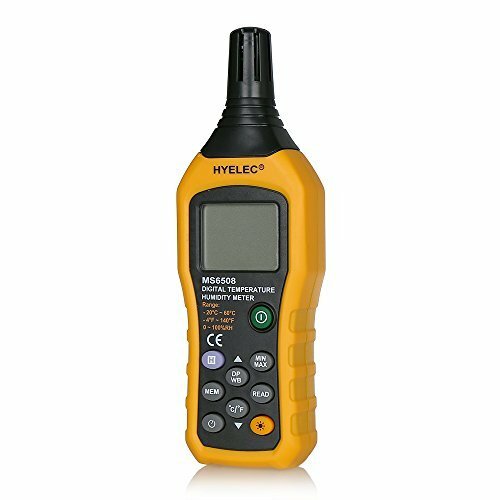 MS6508 is a new type of digital temperature and humidity meter, which designed to combine the functions of humidity meter, temperature meter, wet bulb temperature and dew point temperature. If you have any questions about this product by Hyelec, contact us by completing and submitting the form below. If you are looking for a specif part number, please include it with your message.